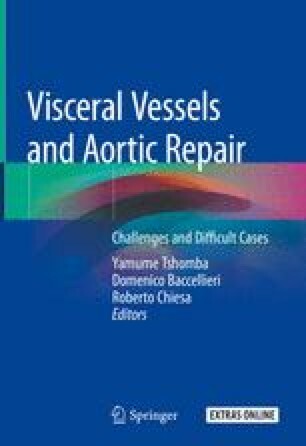 Visceral ischemia is a life-threatening complication of Type B dissection. Static and dynamic obstruction of visceral vessels may be responsible of end-organ ischemia. A timely diagnosis and treatment are crucial to increase the chances of survival. Nowadays, the endovascular approach is the first-line treatment for dissections complicated by visceral malperfusion. It includes thoracic aortic stent graft implantation, dissection flap fenestration, and visceral vessel stenting. In case of failure of these techniques, an open surgical approach is necessary. These include open fenestration and aortic graft replacement.